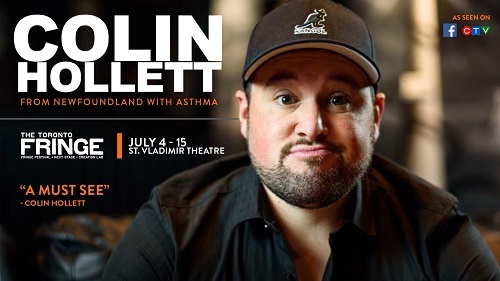 Toronto Fringe newcomer Colin Hollett brings his standup show From Newfoundland with Asthma to St. Vladimir’s Institute. Hollett’s show remains true to the title — he effortlessly weaves tales that are routinely, and often unexpectedly, grounded in his origin as a Newfie (or more broadly, as an East coaster), and as a person with asthma. Overall, I had fun watching this show. I enjoyed plenty of hearty, genuine laughs, and was drawn to Hollett’s presence and physicality as soon as he took the stage. His well-crafted jokes were bolstered by smart use of both imagery and physical comedy. Hollett made ample use of self-deprecating humour in his scripted routine alongside his engagement with the audience. We were certainly not the audience he’s used to, and he directly addressed this a few times. Some of his jokes did not land, but he took the opportunity to poke fun at our sensibilities as a Toronto theatre-going audience. He alternated between making fun of us and himself in these moments, which almost always helped to break tension. A handful of jokes made me feel a bit disengaged from the show. Right off the bat, Hollett dove into the familiar routine of “you can’t say anything these days” and “people are too easily offended”. While I agree with some of his observations on toxic call out culture, it’s hard for me not to roll my eyes when I hear a premise that I find a bit old, as well as the argument that comedy is a space where anything goes (as Hollett insists). Furthermore, many of his critical observations on “people” or “society” ultimately turned to familiar criticisms of women. The one that stands out is a closing joke in which he implores women to simply tell men when they are not romantically interested in them. This joke made me uncomfortable – Hollett insists that men just don’t talk to women once they are clearly turned down. He either forgets, or doesn’t know, that many women don’t give a clear no because evading rejection is often a defense mechanism against many men’s inability to accept it. Despite the premises that made me feel disengaged, the delivery and construction of most of Hollett’s jokes were enjoyable and clever enough to redeem the ones that didn’t sit well with me. From Newfoundland to Asthma is a fun, self-deprecating stand up show and an interesting study in the culture clash between Toronto and the East coast. Content Warnings: Mature language; Unsuitable for minors. Photo of Colin Hollett provided by the company. Thanks for coming out and for your honest review Sarah. I’m glad you enjoyed the show overall.